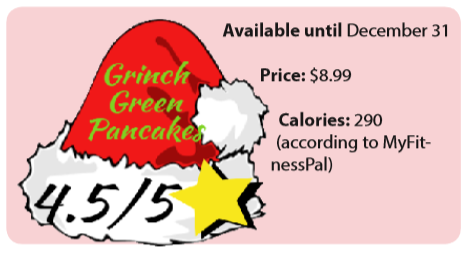 Grinch Pancakes From the variety of foods I’ve tried, I never thought I would be eating green pancakes. After seeing them advertised I knew this was not going to be the average pancake, just by examining the picture. When I finally did some investigating, I read some of the ingredients used to make the pancakes, which shocked me. I noticed they had cream cheese and whipped cream, which appeared to me as strange because I haven’t experienced pancakes without some type of syrup. They also had small hearted candies on top, which I found interesting because I didn’t think those would go well with the pancakes. As soon as they came to the table, they smelled fresh and sweet because of the cream cheese on top. The cream cheese only covered the top of the pancake tower. The heart candies and whipped cream also laid on the top resting in the middle. I smeared the whipped cream as far as I could over the top of the pancakes. Finally, I took my first bite of them and they were delicious. They tasted totally different than a regular pancake, they had a satisfying taste that wasn’t too overwhelming. They had a little sweet taste like cotton candy with a hint of vanilla and didn’t need much help from the cream cheese and whipped cream, although they enhanced the vanilla flavor of the pancakes. The small hearted candies reminded me of the hard hearts that little kids receive for Valentine’s day, so I could do without them because they really didn’t benefit the pancakes at all, I ended up scrapping them off the pancake and leaving them on the side. Compared to regular pancakes they taste better, but I’ve had pancakes that tasted similarly just without the green dye. Although the cream cheese did make this a totally different experience than regular pancakes. They were filling because they are immense sized and fluffy, but the pancakes surely support the holiday spirit of Christmas. Some suggestions of improvement may be adding more cream cheese and whipped cream to make it more flavorful. Besides the hearted candies, I approved them 100% and don’t think they should be a limited item. Other than that, I highly suggest trying these pancakes and finding the Grinch that grows inside of you. It’s finally back! Dairy Queen has brought back their special blizzard of fudge, crunched Oreo pieces, with whipped cream on top. Just hearing about it made me fall in love, and seeing the pictures only made me want it more. Whipped cream on top of ice cream might sound ridiculous, but I think it’s an excellent idea because it brings a creamier flavor to the ice cream. Normally, an Oreo blizzard is with vanilla ice cream so trying it with chocolate was a new experience for me. When receiving the blizzard, it looked exactly how it was commercialized. When I dug in, the flavor was on point, the Oreos made the chocolate ice cream even better. The whipped cream did help settle all of the chocolate flavors that were going on. This is a dessert that I know I will go back and get again. I also disapprove of this item only being only a seasonal item because it can be good all year around. I hope that they bring this item back next year and don’t leave it hiding from consumers. Shouting to all the chocolate, Oreo, or ice cream lovers, this is a dessert calling your name. Don’t miss out on this exciting opportunity of cold hot chocolate experience.